Who may be considered homeless under the law? 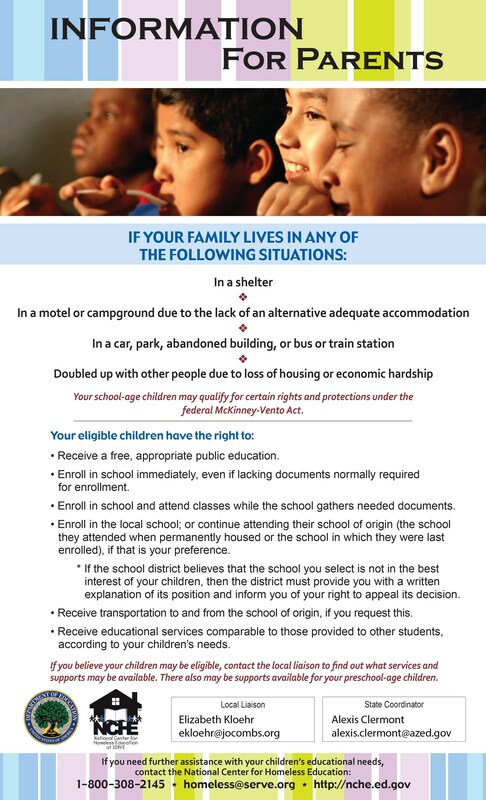 Unaccompanied Youth who lack a fixed, regular, and adequate nighttime residence also have rights under McKinney-Vento. According to the law the term 'unaccompanied youth' includes a youth not in the physical custody of a parent or guardian. What is the Migrant Program? Students who have moved from school to school due to a migratory lifestyle and whose parents work or are actively pursuing work in agriculture may be eligible for additional resources through the Migrant Education Program. Who may be considered migrant under the law? If you believe your child qualifies for either program, please contact Elizabeth Kloehr at 480-987-5304 or ekloehr@jocombs.org. J.O. Combs Food and Clothing Bank is open Tuesdays during the school year from 9am - 11am and 1pm - 4pm. Contact Elizabeth Kloehr for more information at ekloehr@jocombs.org or 480-987-5304.